The final teen year of this century starts and so does another year of cinematic exploration. A quick glance suggests 2019 to be unexpectedly underwhelming for the Hollywood mainstream, considering the year features no movies from Nolan, Fincher, Aronofsky, Villeneuve, Anderson (Wes and PT), the Mexican trio (Iñárritu, Cuarón, del Toro) or even Spielberg. But don’t fret yet. Tarantino, Scorsese and Linklater among others will keep us entertained. In addition, there are nine superhero movies and to cap it all off (and keep you impatient all year), 2019 ends with Star Wars IX! For now, here’s a preview of the first-half of the year, showcasing 25 popular movies releasing between January and June. Do not let the wait for December get to you; there’s a major movie event much closer. Thanos returns in April! Note: Release dates mentioned are for the USA for the sake of some order. They are also, due to the hardest choices requiring the strongest wills, subject to change. Thoughts: M. Night Shyamalan’s career has undergone one of his own movie’s twists. He went from the highs of critical and box office darling (The Sixth Sense, Unbreakable, Signs, The Village) to making some of the worst movies of their release years (The Happening, The Last Airbender, After Earth). But his Cosine wave career (math joke!) seems back at a high with 2017’s Split. Glass will complete his unorthodox superhero trilogy, and anything less than a great film could diminish the accomplishments of the previous two. Shyamalan should change his middle name to Trepidation. Premise: The mysterious past of a fishing boat captain comes back to haunt him, when his ex-wife tracks him down with a desperate plea for help, ensnaring his life in a new reality that may not be all that it seems. Thoughts: Matthew McConaughey and Anne Hathaway come together after Interstellar in a modern noir, working for a director who can make a fantastic movie out of a single scene. If you haven’t yet, check out Steven Knight’s previous movie Locke. You will understand why this movie is on the radar. Premise: It's been five years since everything was awesome and the citizens are facing a huge new threat: LEGO DUPLO® invaders from outer space, wrecking everything faster than they can rebuild. Thoughts: The Lego Movie (2014) was expected to be a shallow product cash-in, but turned out to be a critical and commercial success on the back of Lord &amp; Miller’s now-recognized creative brilliance (Cloudy with a Chance of Meatballs, 21 &amp; 22 Jump Street, Spider-Man: Into the Spider-Verse). The sequel has the duo return, but as writers only. It looks fun enough but expect diminishing returns associated with standard sequels. Premise: Two years after the events of the first film, Tree Gelbman unexpectedly re-enters the time loop and becomes determined to escape it after finding out her friends are now involved. When she discovers that Lori Spengler, the original killer, has been murdered, Tree must face the new killer in order to uncover their identity and break free of the time loop once and for all. Thoughts: Blumhouse is a very careful production house that aims for success on the back of small budgets and creative liberties. The first Happy Death Day was the most fun original slasher movie in years, and hence the genre-standard of an inevitable sequel. It could be worthwhile just for Jessica Rothe, who was a lot of fun as the lead in the first movie. Premise: An action-packed story of one young woman's journey to discover the truth of who she is and her fight to change the world. Thoughts: Since his departure from the DGA (over director credits on Sin City), Robert Rodriguez has been hampered in his film-making, finding little commercial success and even lesser critical acclaim. James Cameron though must have something specific in mind when he hand-picked Rodriguez to helm a movie that Cameron has written and produced. The CGI of this manga-adaptation looks on point, and the kinetic energy of Rodriguez’s directorial style matches the genre. Will this be a Cameron-level success or Rodriguez-level failure? More likely they average out. Premise: As Hiccup fulfills his dream of creating a peaceful dragon utopia, Toothless' discovery of an untamed, elusive mate draws the Night Fury away. When danger mounts at home and Hiccup's reign as village chief is tested, both dragon and rider must make impossible decisions to save their kind. Thoughts: This trilogy is proving to be the most non-typical animated series of the modern era. The first is comparable to Iron Giant for playing like an indie movie from a studio (with great 3D even). A sequel that took its time and didn’t pander to toy-selling (and featured Cate Blanchett) is now followed by this third installment that just looks the kind of mature and fun we want more of. Thoughts: Doug Liman is a competent director that relies too heavily on the script being good. Chaos Walking should therefore be of his better movies, considering Charlie Kaufman wrote it. Add to it that the director’s last brush with mind-bending scifi led to the outstanding Edge of Tomorrow. The noteworthy cast is a bonus (Tom Holland has especially been astute with his script choices). Thoughts: Unknown directors, a non-popular superhero (outside comic-book circles), a segue from the Thanos storyline, and a trailer that projects a tone vastly different from the MCU style. But in Feige we trust. For fans, the biggest question will be whether Brie Larson has it in her to take over the mantle from Robert Downey Jr. as the central figure of this sprawling franchise. Of course, that is all secondary to what clues the film provides to the undoing of the Snappening. Premise: Plot unknown. Described as a "social horror-thriller." Thoughts: Watch the trailer. Oscar-winning Jordan Peele’s second movie is another mind-bending horror, and if that trailer is anything to go by we are in for a treat again. Get Out also revealed a warped look at the American racial tensions (Slavery due to… inferiority complex?). Could Us also open our eyes to a new angle of racism seldom discussed? Premise: After her anxiety-ridden mother disappears, 15-year-old Bee does everything she can to track her down, discovering her troubled past in the process. Thoughts: Linklater-Blanchett is the kind of collaboration us Filmphorians pray for. Either of those names would get their movie into this bi-annual article. Both together makes it one of the top two anticipated films on this list. Premise: A young elephant, whose oversized ears enable him to fly, helps save a struggling circus, but when the circus plans a new venture, Dumbo and his friends discover dark secrets beneath its shiny veneer. Thoughts: Another Disney animated classic remade as a live-action movie. Another A-list director hired to translate (not reimagine) the hand-drawn as computer-drawn, with an A-list cast filling up the regrettable need for actors. Dumbo is also just the first of three such remakes from Disney in a span of five months, Aladdin (24th May) and Lion King (19th July) being the other two. At least this one stars real actors as human characters. Premise: Set in a Chicago neighborhood nearly a decade after an occupation by an extra-terrestrial force, Captive State explores the lives on both sides of the conflict - the collaborators and dissidents. Thoughts: Rupert Wyatt is an appealing director to follow. 2 of his career-total 3 feature films are the underrated The Escapist (2008) and highly-rated Rise of the Planet of the Apes (2011). A failed Mark Wahlberg film later, he seems more in territory with this sci-fi thriller about humans resisting alien occupation. Considering the visuals of the two trailers, it just may be worth his walking away from the cancelled Gambit movie! Premise: We all have a superhero inside us, it just takes a bit of magic to bring it out. In Billy Batson's case, by shouting out one word - SHAZAM! - this streetwise 14-year-old foster kid can turn into the adult superhero Shazam. Thoughts: The DCEU seems to be doing better with its single-hero outings, as evident with successes of Wonder Woman and Aquaman (I’d argue Man of Steel as underrated too). Another such solo feature, Shazam taps into the family-film sub-genre. In fact, it appears to have more in common with Home Alone than Superman! Zachary Levi may be the unlikeliest actor to play a superhero since Paul Rudd (Ant-Man), but this lower budgeted movie also has the lowest expectation of any DC film this century. Note: the success of this movie will fast-track a sequel likely to co-star Shazam’s arch-nemesis, Black Adam. Already contracted for the character (for whenever he appears on-screen) is… Dwayne “The Rock” Johnson! Premise: Based on the graphic novels by Mike Mignola, Hellboy, caught between the worlds of the supernatural and human, battles an ancient sorceress bent on revenge. Thoughts: First things first – Neil Marshall is a competent director (have you watched The Descent or Dog Soldiers?). Also, there is hardly anyone who does not like David Harbour (Police chief Jim Hopper from Netflix’s Stranger Things). Yet, it defies all logic that the studio decided to reboot Hellboy rather than let Oscar winner Guillermo del Toro reteam with Ron Perlman to complete his trilogy. Of all the lost unproduced movies in Hollywood’s history, a third del Toro Hellboy does NOT deserve to be on that list, as will be attested by any sane person who has watched the first two. With a release date one fortnight before Avengers: Endgame, the chance of success foe this reboot is slim, even if it turns out to be a good film. Premise: The fourth installment of the 'Avengers' series. Thoughts: AKA Iron Man, Thor, Captain America, Hulk, Spider-Man, Doctor Strange, the Guardians, Ant-Man, Black Panther, Black Widow, Hawkeye, Scarlet Witch, Vision, War Machine, Winter Soldier, Loki, Wasp, Captain Marvel -VS- Thanos. Perfectly balanced, as all things should be. Premise: In a world where people collect Pokémon to do battle, a boy comes across an intelligent talking Pikachu who seeks to be a detective. Thoughts: It seems odd to look forward to a Pokémon movie, if not outright embarrassing. But this does look like fun, giving off all the good vibes of Who Framed Roger Rabbit?. CGI Pikachu (voiced by Ryan Reynolds) actually looks reasonable, and not cringy/loud as he could easily be. It should be acceptable for an adult to say it makes one just a tad bit curious, correct? Premise: The third installment of the 'John Wick' series. Thoughts: This is the third John Wick movie in 5 years. Could it be a case of overkill? While the second kept the action good and the story uncomplicated, there is a danger of it all getting either repetitious or too over-the-top (exhibit A: the Fast &amp; Furious franchise). That said, Keanu Reeves makes for an awesome action hero. Give him guns, grunts and some creative set pieces, and we’re on. Premise: A live-action retelling of the 1992 Disney film of the same name. Thoughts: Will Smith is possibly one of 3 names* that can reimagine (not mimic) Robin Williams’ Genie and still have fan support. All the CGI work on his character aside, Aladdin is populated with mostly human characters and hence is one of the better opportunities for Disney’s live-action adaptions to really do something creative, as with Alice in Wonderland (2010), Maleficient (2014) and Cinderella (2015). Imagine "Friend Like Me" performed by Will Smith! * The other two actors: Jim Carrey and Jack Black. Premise: Astronaut Roy McBride travels to the outer edges of the solar system to find his missing father and unravel a mystery that threatens the survival of our planet. Thoughts: The director of The Lost City of Z gets together with the actor and actress of World War Z for this deep space movie that is described as an epic sci-fi thriller. An original space movie is rare enough. The release date and star-cast + crew (the DoP is Hoyte van Hoytema of Interstellar) further indicates a movie worth looking forward to. Premise: What if a child from another world crash-landed on Earth, but instead of becoming a hero to mankind, he proved to be something far more sinister? Premise: The crypto-zoological agency Monarch faces off against a battery of god-sized monsters, including the mighty Godzilla, who collides with Mothra, Rodan, and his ultimate nemesis, the three-headed King Ghidorah. Thoughts: 2014’s Godzilla was a surprisingly restrained monster movie that kick-started a cautious new shared universe. Kong: Skull Island followed 3 years later that worked stand-alone yet took a similarly spectacular but confined take on King Kong. The third movie of the series now comes from a director known for a cult Halloween movie (Trick 'r Treat) and goes full-scale upsize in monster lore. Basic CGI spectacle aside, the teaser doesn’t hit the right notes yet. However, given the post-production work left and the quality of the preceding two movies, it is easy to be optimistic. Premise: Jean Grey begins to develop incredible powers that corrupt and turn her into a Dark Phoenix. Now the X-Men will have to decide if the life of a team member is worth more than all the people living in the world. Thoughts: The release for this movie has been postponed twice now, and meanwhile the Disney-Fox merger is complete. Hence, there is little doubt that Dark Phoenix is not affected by the fact that the X-Men now belong to Disney and report to Kevin Feige (Yay!). Given the sheer potential of the on-screen talent involved here, as well as the MCU-changing event that Avengers: Endgame will be, the landscape of Marvel superhero cinema will be redefined in these six weeks. The 20-year X-Men era finally ends… or does it? Note: Composer Hans Zimmer, who had announced his retirement from superhero movies, decided to return to the genre with Dark Phoenix because Kinberg’s story idea creatively inspired him. Premise: The Men in Black have always protected the Earth from the scum of the universe. In this new adventure, they tackle their biggest threat to date: a mole in the Men in Black organization. Thoughts: F. Gary Gray stays firmly a step behind good when it comes to his movies, and it is foolhardy to expect anything more from this MIB rerouting. What he lacks, he makes up for with fun. Luckily, he has Chris Hemsworth and Tessa Thompson to work with, who have proven their chemistry in Thor Ragnarok. The ingredients one needs for an enjoyable forgettable summer blockbuster. Premise: When a new toy called "Forky" joins Woody and the gang, a road trip alongside old and new friends reveals how big the world can be for a toy. Thoughts: The Toy Story trilogy is one of the greatest movie trilogies ever made, so a fourth instalment should be good news, right? Toy Story 3 ended on such a perfect note that another sequel seems unnecessary. A new director is at the helm and John Lasseter, the creative force behind the original trilogy, is no longer associated with Pixar. All that aside, the goodwill of Pixar stands strong and there is no doubting how carefully this movie will be crafted. What's more, Keanu Reeves voices a new character! Premise: The true story of the battle between Ford and Ferrari to win Le Mans in 1966. Thoughts: James Mangold’s follow-up to Logan is this real-life story about Ford’s big challenge to Ferarri’s dominance at the Le Mans 24hr race. In true American filmmaking spirit, all the good guys represent Ford (Bale and Damon are playing Ford teammates, not rivals) while Ferrari is the big bad. Should be fascinating to see how (and if) Mangold manages to balance nationalism with global appeal. Other movies of interest releasing in the first half of 2019: Greyhound (Tom Hanks), Pet Semetary (Stephen King adaptation), Rocketman (Elton John biopic), High Life (Robert Pattinson and Juliette Binoche in a space set horror sci-fi), Shaft (again with Samuel L. Jackson) and a reboot of Child’s Play (Chucky!). Netflix will also have many releases from major directors as diverse as Martin Scorsese and Michael Bay, but none of those have release dates yet. Look for Filmphoria’s weekly post “Out This Week” every Thursday to keep up-to-date! Wish you a Happy 2019, and a wonderful time at the movies! 44-minute talk about this film-making. And how bloody GORGEOUS are the teasers for The Wild Pear Tree, another 3-hour opus! Also, I would probably remove both The House that Jack Built and Everybody Knows from this list..
Arctic - Played at Cannes, very well received. Birds of Passage - From the director of Ebrace of the Serpent, well received. Three Identical Strangers - Winner at Sundance, highly acclaimed. Non-Fiction - Oliver Assayas, Juliette Binoche, playing at TIFF. I had forgotten about this silly, silly on the nose film. Some of these answers seem silly and made-up as after-thoughts that conveniently explain but don't fit. This is Avengers, not Blade Runner. Luchino Visconti’s Palm D’or winner is an exquisitely sumptuous affair that leaves you aching for more despite it’s 3 hour length. Starring Burt Lancaster as an aristocratic Sicilian Prince who struggles to retain a way of life in a fast changing world albeit begrudgingly accepting the inevitable, the story covers a period when Italy was going through a political change resulting in aristocracy and royalty losing their significance. 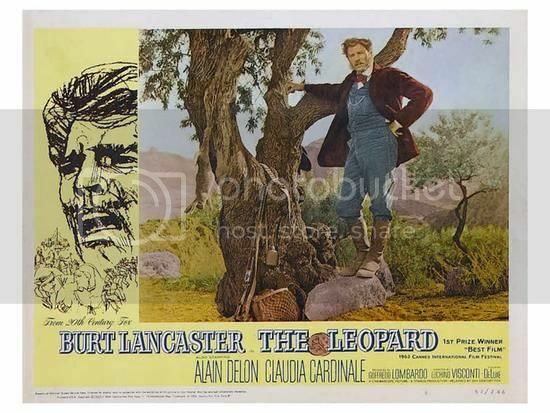 Lancaster plays the role of a patriarch in a large family that includes his nephew (a roguish Alain Delon) and his fiancee (the ever stunning Claudia Cardinale). The film is gorgeously shot with a beautiful score by Nino Rota and some splendid performances. Lanacster doesn’t seem one bit miscast he looks the part and sounds it in a dubbed voice though. If Visconti is up your alley, do look up “Senso” and “Le Notti Bianche”.